In the midst of a serious health emergency, the last thing we need is the sight of two agencies of the executive department bickering over who is at fault for the outbreak of a potentially fatal disease. 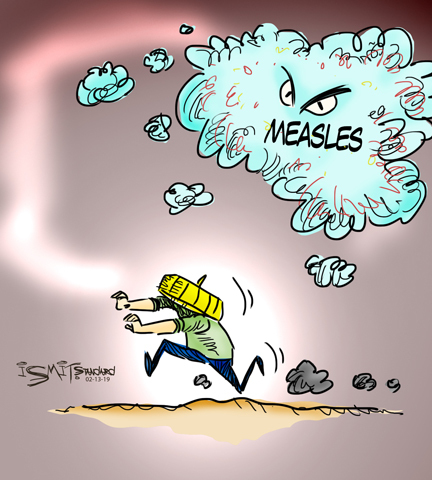 Yet this is exactly what the public is seeing as health officials scramble to deal with an outbreak of measles in Metro Manila, other parts of Luzon and Central and Eastern Visayas. In the first 33 days of the year, the Regional Epidemiology and Surveillance Unit of the Health department reports, there were 560 measles-rubella cases with 14 confirmed deaths—409 percent higher than the same period last year. By Feb. 10, the department says, the death toll from the outbreak reached 70 nationwide and the number of cases has ballooned to 4,300. Against the backdrop of these grim numbers, Health Secretary Francisco Duque III and Public Attorney's Office chief Persida Rueda-Acosta have been engaged in a word war over who is to blame. The Health secretary and his subordinates say the PAO chief is to blame, because her aggressive campaign last year to punish those responsible for the Dengvaxia mess undermined public confidence in the government's immunization program. As a result, fewer children are being vaccinated, leaving them susceptible to infection. The PAO chief, on the other hand, correctly observes that it is not the job of her office to distribute vaccines; that is the job of the Department of Health. She also points to Commission on Audit figures that show vaccination rates for contagious diseases such as measles declined in 2014, 2015, 2016 and 2017 – even before the Dengvaxia scare that broke out in late November 2017. The Palace, for its part, has come to Acosta’s defense, saying she was merely doing her job to provide legal assistance to the families of children who died after receiving Dengvaxia. Certainly, there are valid points in all these arguments, but is now really the best time to go into another round of finger pointing? How will all the bickering through the media help the children who have been infected, and protect those who have not yet been properly vaccinated? Will the public display of discord do anything to bolster the public confidence in the government’s immunization program? We think not. In the heat of internal disagreements and politics, both sides seem to have forgotten that they work on the same team, under the same administration. They also seem to have forgotten that their first duty is not to personal pride, but to the people who voted this government into office. Perhaps it is time the President reminded them of this.